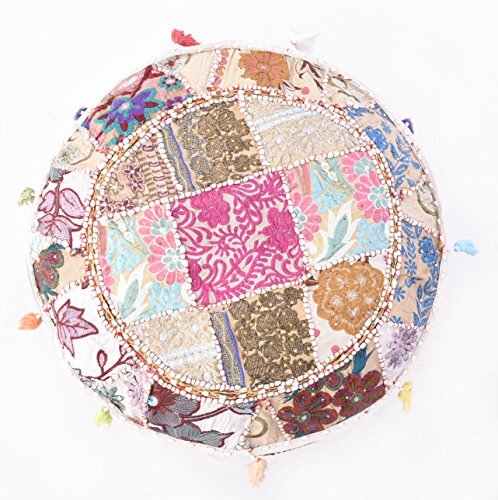 Jewel Fab Art Brilliant Indian Vintage Handmade patchwork Gypsy Ottomans Stool Sette Bohemian Flouver Embroidered Boho Khambhadia Traditional Pouf Cover with embroidery work solves your seating and storage problem. It is easy to move without any great effort. Just cover up your ottoman and Pouf and you are ready to sit.From Jewel Fab Art, a fair trade group sometimes all you need is one work of art to bring an entire room together.It is a great and affordable way to add some comfortable seating for your guests!,Perfect Gifting Option. Be a part of the Jewel Fab Art family and experience a relation of trust, a promise of quality and a tradition of happiness. Official Jewel Fab Art Merchandise. Original prodcut with satisfaction guaranteed. If you have any questions about this product by Jewel Fab Art, contact us by completing and submitting the form below. If you are looking for a specif part number, please include it with your message.